Although postal dates for several versions of this card are in the 1920s and one of the two versions owned by the web mistress was posted in 1934, the original photograph is believed to have been taken either just before or during the First World War. Unusually, it shows a large number of people outside the premises. Were they celebrating a Coronation, a Jubilee, mourning someone or just having their picture taken? It is difficult to know if the people on and near the steps were staff or guests. The woman on the steps, leaning against the wall, could have been a bath woman or a cook but she was most probably a woman in her best dress! Behind the group are several female members of staff peeping out through one of the windows. The roof terrace, described as "an unusual feature" in the summer of 1918, gave what was considered to be an unrivalled opportunity for the guests to enjoy the hydro's southern view to the full. It looks newly built here as the stone has not discoloured and the grounds in front of it are freshly planted. The terrace extension replaced the original conservatory which featured in a number of photos in the Vernon Lamb Archive that were taken before the first war. The people on the terrace on the right and on the first floor roof are probably guests. Lubin George, who had taken over the hydro following his mother Rachel's death, is about half way along the terrace. He was the third generation of the Davis/Wildgoose family at Oldham House and Prospect Place and other pictures of him around this time point to the photos date of being around the dates suggested above. OLDHAM HOUSE.-Mr and Mrs Wildgoose (daughter of the late Thos. Davis) Hydropathic Establishment, next door to Prospect place, Matlock Bank. N.B. An experienced Bathman in attendance. She was to buy Prospect Place in 1899 for about £2,500 and the two businesses became one. This image shows the combined properties, joined together by the new build with its roof terrace. 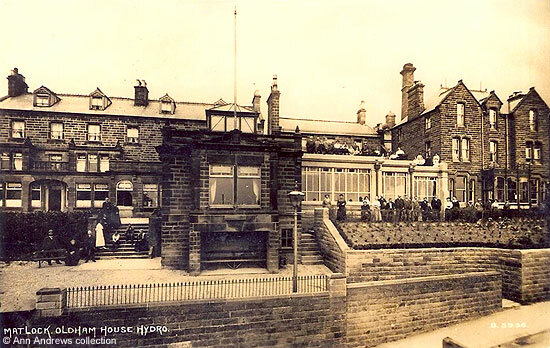 Prospect Place/Terrace had been dropped from the hydro's name and it was now know as simply Oldham House. "Matlock, Oldham House Hydro", Photochrom Co. Ltd., London & Tunbridge Wells, no. B.5936. "Derbyshire Advertiser and Journal", 28 June 1918. Attractions of the Matlocks. A Mid-England Beauty Spot. "The Sheffield & Rotherham Independent", Monday, 15 May, 1893. "Derbyshire Times", 27 May 1899. The purchase was made after an auction. It is quite possible that the Davis family were selling it following the death of Mrs. Davis, the mother of Mrs. Wildgoose.